This challenge is to pop up a sentiment. Well, that field is wide open and when I'm given that many choices I'm practically overwhelmed. I was this time...UNTIL I pulled out one of my new Pure Innocence stamps. Is she not the cutest little girl you've ever seen or what? I love the sentiment that came with it, too. This was an easy card...believe it or not...at least, it came together easy. The card base is white with another white panel on top of it that has been embossed with the Dotted Swiss EF. 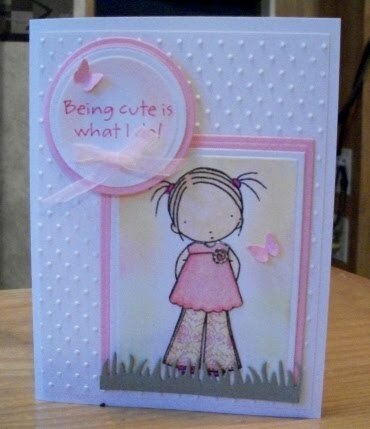 My favorite thing to do with these little Pure Innocence stamps is to paper piece. She just looks like pink to me. I first stamped her on white. Then I stamped her clothes on two sister pieces of designer papers. I even paper pieced her little flower on her blouse in the same as the pants. I cut that piece from a rectangle Nestie and embossed, sponging Summer Sun and Cameo Coral for the sky and Old Olive for the ground. I cut another larger piece from Pretty in Pink and embossed it, too. After this, I colored her with Copics and glued the clothing pieces on. I used a Fuschia Glitter Marker and colored her barrettes, shoes and the center of her little flower. Because the marker is wide, I went outside the lines a little on her shoes. I couldn't have that, so I thought to cut a little piece of grass to cover them. You can still see the shoes but you don't see the boo-boos...whew!! Then I stamped the sentiment in Pretty in Pink then again in Rose Red. It kinda gave it a shadow. With the die still in place, I sponged Pretty in Pink around the edges. I had this pretty little pink ribbon so I added it and of course, I had to add some of my favorite butterflies. The sentiment was raised with foam adhesive and placed over the image piece. I hope you like this card as much as I did making it. Such a sweet card! Great idea on the grass to hide the boo boo!! Lol! Very Sweet! Love how you used the white paper. love the groovy pants. Thanks for the detail on how you put this together, it's really helpful!